VHT provides a multi-step high performance coating system for the ultimate in protection. Brake and parts cleaner quickly cuts through grease and grime, but it does not leave an oily film. You should always have a few cans of brake cleaner from PitStopUSA.com on hand in the shop and at the track. Check out the Recently Listed Paint. Not available for shipment to Alaska, California or Hawaii. Ground Shipping Only! Ships from Michigan. Not available for shipment to Alaska or Hawaii. Pit Stop USA is The Online Motorsports Superstore! VHT provides a multi-step high performance coating system for the ultimate in protection and quality. 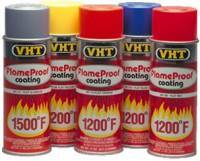 VHT FlameProof Coating will renew and extend the life of any surface exposed to extremely high temperatures. VHT 550F Engine Enamels are a unique blend of urethane resins, which produce a tough and long-lasting finish for engines, engine accessories or wherever a tough durable heat or chemical resistant finish is needed. VHT Brake Caliper, Drum and Rotor Paint has been specifically designed for the custom detailing of brake components. VHT Nu-Cast Engine Enamels are unique formulas developed to restore OEM parts to their original newly cast appearances. VHT Epoxy Paint is a one-step epoxy ester resin, which does not require the use of a primer. VHT Prime Coat is an excellent foundation for any enamel, epoxy, acrylic or synthetic lacquer. VHT Quick Coat Enamel is a premium quality coating, which provides extra hide and durability for interior or exterior applications. VHT Chassis & Roll Bar Paint is a one step epoxy ester resin that does not require primer. VHT Wrinkle Plus combines strong colors with a deep rich texture for a custom look It is temperature resistant to 350F and is ideal for adding a touch of personal styling to almost any metal surface. VHT Wheel Paint provides a great finish and real protection for all standard and custom wheels. VHT Genuine Lacquer is a superior quality lacquer formulated for the ultimate in gloss and durability. VHT Nite-Shades is a transparent black tail light lens coating for creating a custom European styling. VHT Metal Tint is a non-tarnishing metallic coating formulated to give a plated or anodized look to aluminum, plated or polished metal surfaces. VHT Plastic Paint was specifically formulated for automotive applications to adhere without scratching or flaking. VHT Vinyl Dye for vinyl and carpeting restores or changes the color of any vinyl upholstery, seats and trim.